In the heart of the “Pink City” of Jaipur, India exists a centuries-old observatory used for numbering the stars and counting the minutes. Though outdated in terms of its technological prowess, the stationary instruments at Jantar Mantar continually prove their relevancy in astronomical science, as well as currently holding the record for world’s largest sundial, towering as they do at over 27 metres tall. The Samrat Yantra, meaning “The Supreme Instrument”, is used for calculating the time of day to the exact second using the position of the dial and the shadow it casts from the sun. If an astronomical observer knew the time it took a prominent star to transition the sky, they could even use the Yantra tell the time at night. Maharaja Jai Singh II built Jantar Mantar early in the 17th century as one of five such astronomical observatories throughout India. This particular observatory is the largest of the them all and is based upon the observatory built in New Delhi (below). The other three can be found in Ujain, Mathura, and Varanasi. James has previously put together some instructions for reading sundials on Google Earth – who thinks than can work out the exact time these images were captured? Based on the shadows, it must be some time before noon, local time. I’m too lazy to repeat James’s exercise but it should be easy, peasy as India doesn’t observe daylight saving time. Only the offset of 30 minutes would make it a trick question. The sundial in the picture looks about 10m tall. There is no way it is 27m tall. I might be 27m long (horizontally). Timothy, the second picture (profile of the sundial) is of one of the smaller sundials at the observatory. Take a look at the map and the picture. 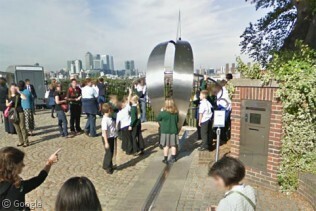 It’s quite possible that the picture was taken from the top of the 27m sundial. What about the Sundial Bridge in Redding, CA? Wikipedia says the mast “that serves as the gnomon of the world’s largest sundial” is 66m high. That’s only a gnomon, but there’s no way to know what it is. In fact, the Sundial Bridge includes not just a gnomon (the support tower of the bridge) but a large dial marked with times. It is most accurate at the summer solstice but it was still very close when I visited two months later. So yes, there is a way to know what time it is. Rats, and there was I thinking it was a launch ramp for flying pigs. I live in Redding, and I’m pretty sure the Sundial Bridge is the world’s largest sundial.